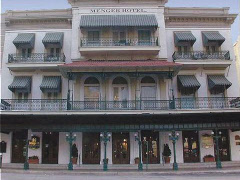 Only one hundred yards from The Alamo, The Menger Hotel is a true San Antonio landmark. Built as a two-storey hotel in 1859, it has been extended over its lifetime and now offers a total of 316 rooms. Famous guests include Theodore Roosevelt, Ulysses S Grant, Robert E Lee, Mae West, Babe Ruth, and Sarah Bernhardt. The Menger is three-star rated, and offers a restaurant, bar, wellness centre and outdoor swimming pool.